If you were ever the kind of person to want value for money from your gamebooks, Talisman of Death is your way to go. Not because it takes a million attempts to finish (in fact, I completed this one) but because it is long. Loooong. Just when I thought I'd be nearing the end, or dead, bam and there I was, right back in it. You're an ordinary Earth guy, at least I think you're ordinary as there's no background at all really, except that you seem to have some psychedelic dream and suddenly you're the chosen one in the world of Orb, chosen to save the world that is. As all chosen ones are these days. You have to take the Talisman of Death (what kind of craftsman would even create a 'Talisman of Death', let alone allow it to fall into the wrong hands? )back to 'your' world, ie. Earth, to save the world of Orb. No mention is made what might happen to Earth once it contains this evil thing, but hey. One of the differences I noted in this book is by this point, book 11, Jackson and Livingstone had finally worked out a combat system for fighting more than one opponent at a time, and it shows - almost every fight that isn't against some ridiculously formidable foe (more on that later) is against two average/weak guys. They, or the authors, obviously weren't too sure if this new system was fair though, often letting fights end well before either party was near death, or having one of the double-team pull out. They wouldn't be so kind in later books, from memory, knowing that most people end up cheating the dice anyway. I rolled average stats with good luck, and set out on my quest, which in a few ways reminded me of an old Commodore 64 text-adventure I used to play. Anyway, I quickly came across a bunch of travellers and told them I was on a quest against evil, which they told me was a lie. I told them I was from another planet, which they knew was the truth. Was this not a quest against evil? Whose side was I on? They gave me a ride to the local town, where they made me hand over my gears and stole the Talisman. Phew! I was sick of running from evil spectres and whatnot who were after that thing. At one point, I was given the option of running towards some dark elves (who were probably out to get me) and running for the hills. I chose the latter, obviously. Relieved of my sacred duties and in a medieval-esque world I'd no care for, I hit the bars on the Hamburg-esque 'Street of Seven Sins'. I fought some guys, got a holy sword and slept on a bale of hay in an inn, all without paying, and hooked up with a bunch of thieves who going by artwork were also transported from Earth, more specifically 1940s Russia. We discussed plans for a heist (to get the Talisman back, damnit), and when I told them where it was, they killed me. But... my spirit was re-combined with my body, and my quest began anew. I told you this book was long. All this re-combining happened in the Valley of Death, by the way, which I thought was a totally cool Coolio reference. 10 years in advance. So, fast-forwarding a little, I re-meet the thieves, and this time keep the important info to myself, for now. We regained the talisman, defeating their leader Hawkana with a heavy use of luck. I didn't used to use so muc luck in battles when I was younger, but maybe I cheated then, unlike now, haha. And fast-forwarding a little again (I told you this book was long), I made it to the end... only to be killed by a dragon. Well, killed, and re-incarnated again. Goddamnit. By this point I was kind of just wishing the book had some balls. This time I didn't have to go too far back, and it was a matter of not doing what I did last time that killed me, some lucky rolls, and I'd defeated the dragon in battle (wasn't even a real dragon, even if it could really kill) and saved the other world, the one that gave me nothing but grief and death. 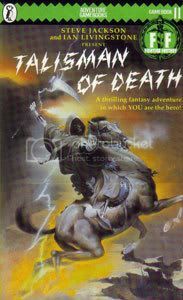 Despite the length and illogical plot, Talisman of Death was actually quite enjoyable. The sense of freedom that came with losing responsibility of looking after the talisman in the town was great - it's not often in FF gamebooks you get to just wander around a town, checking out the stores. A good, if frustrating entry in the catalogue. This one is definitely my all time favorite. The book does include several proper deaths in addition to the ones that lead to your being sent back in time. Being buried alive by a horde of zombies is one of the more distinctive ones. Buried alive by a horde of zombies? Awesome. I love the flavour of this book, too. For one thing, not only are there quite a few paths to your final destination, but I find all of them to be interesting. This allows great replay value. Ironically, the resurrection rules where you keep going back in time after getting killed might have killed the replay value, since it's possible for you to end up trying every single path in just one sitting. But it's still a fun book to play, nonethless. I have only just discovered Fighting Fantasy...like what, 20 years too late? Anyway, I've always loved early text-adventure games and FF gamebooks seem to be along the same lines. Thanks for doing these! I enjoyed this one, particularly as the world of 'Orb' is also the setting for the 'Way of the Tiger' books by the same authors, where you play a totally awesome ninja who gets to use kung fu moves and other skills like spitting poisoned needles at people (!!!!). Anyway, I really enjoyd this book, particularly the city crawl and the alliance with the thieves. The whole final thing with the mountain and the dragon felt a bit like an anti-climax, and I was just dying to find a way to off Tyutchev and Cassandra for good..